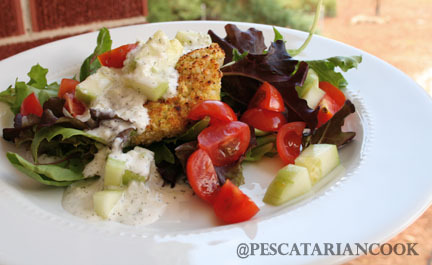 Simple pescatarian recipes for a healthy life! You are here: Home / Hello Falafel! Falafel has really turned into one of my staple dishes. It couldn’t be easier to make and you can literally turn these little cakes into anything. Top it on a salad, throw them in a sandwich or a wrap, enjoy them like a burger, or just eat them plain with a bit of tzatziki. I like to prepare a double batch and then create enough patties to use half for the week and freeze the other half for meals later in the month. Pull out and dust off your food processor, and plop in the following ingredients. Let this mixture sit for about 10 min so that the breadcrumbs set up in your falafel batter. This will allow you to scoop the mixture, create a patty and coat with panko bread crumbs. Once your breaded patties have been created. Heat a medium pan on medium high heat (choose something non stick like a cast iron pan) with about 2 Tbs of oil of your choice (I use olive oil). Once your oil is hot place your patties in the pan. Flip carefully with a spatula. Brown on each side and serve! Copyright © 2019 The Pescatarian Cookbook.